Europe Residential Boiler Market size was valued over USD 5 billion in 2017 and annual installation is anticipated to exceed 6 Million Units by 2024. Growing adoption of energy efficient space heating systems coupled with shifting trends toward nuclear family will stimulate the Europe residential boiler market size. As per the European Commission, the number of privately owned houses in the region has increased by 6% between 2009 to 2017. In addition, ongoing expansion of the gas pipeline infrastructure fueled by massive investment plans will further augment the industry landscape. 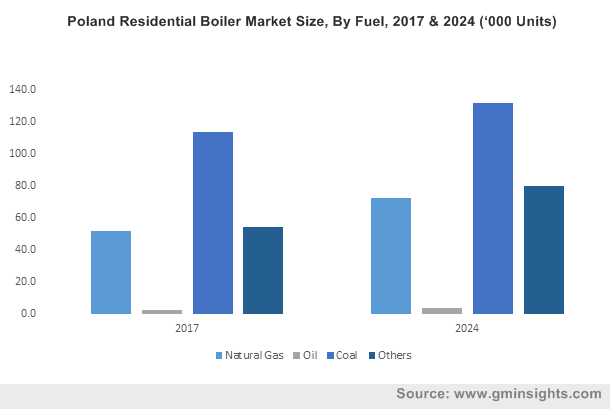 Introduction of stringent government regulations toward carbon emissions and minimal efficiency requirement standards will drive the residential boiler market growth. Growing concerns over global warming coupled with implementation of stringent building efficiency codes will further complement the business landscape. For instance, the EU, in July 2018, introduced revised Energy Performance of Buildings Directive (EPBD), under which all the new buildings are mandated to fulfill the criteria for zero-energy buildings by 31st December 2020. Condensing residential boiler market size is anticipated to witness growth over 2% by 2024. These heating systems can attain energy efficiency of up to 95%, as compared to 70%-80% for furnace based heating units. Moreover, high energy efficiency along with simple controls and compact design are some of the other key features that will define the product’s supremacy over the available counterparts. Legislative initiatives aimed toward sustainability and energy conservation will further drive the replacement of traditional heating systems. Non-condensing residential boiler market is predicted to witness a subdued growth on account of high carbon footprint, low energy efficiency, high maintenance and high operating cost. These systems offer efficiency in the range of 80%-85%, which is 10%-15% less than condensing boilers. 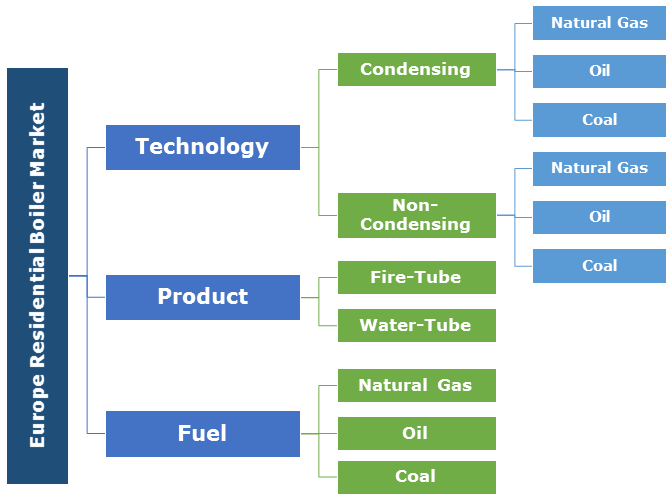 However, the product demand may persist in medium term on account of their longer operating life, low initial cost and its ability to operate at high temperatures. Fire-tube residential boiler market is anticipated to witness gains over 1% by 2024. Low operation and installation cost along with compact design and ability to meet fluctuating steam demand will boost the product penetration. Water-tube residential boiler market is predicted to witness a robust growth on account of increased adoption of underfloor heating systems. Low radiation losses, quick response and high-pressure handling capacity are some of the key features which will fuel the product adoption. Gas-fired residential boiler market is set to exceed an annual installation of 3 million units by 2024. High efficiency, reduced carbon footprint and compact design are some of the paramount factors that makes the product preferable over the available alternates. Furthermore, easier accessibility to fuel during harsh climatic conditions will further support the industry growth. Several European countries are investing toward expansion of gas pipeline networks in response to rising heating demand from domestic sector. For instance, the European Gas Pipeline Link (EUGAL) has planned a natural gas pipeline link of 485 km, aimed at enhancement of gas supply network across Germany. Oil fired residential boiler market in 2017, was valued over USD 800 Million. Growing inclination toward adoption of high efficiency space heating systems along with introduction of new technologies toward achieving better efficiency will stimulate the product demand. Price stabilization in conjunction with government initiatives to curb the greenhouse gas emissions will further fuel the business growth. The UK residential boiler market is anticipated to grow over 2% by 2024. Introduction of stringent government standards toward energy efficiency of heating devices along with growing investment across residential sector will fuel the product demand. Increasing consumer spending, most notably across Scotland and England will further propel the industry growth. Rigorous government regulations toward maximizing building efficiency along with expanding population size will drive the Poland residential boiler market growth. Huge potential to cut down GHG emissions from residential sector along with government initiatives toward promotion of energy efficiency will positively influence the business landscape. Notable players operating across the Europe residential boiler market include BDR, Hoval, Immergas, Viessmann, Bosch, Groupe Atlantic, Ariston, Weishaupt, Fondital, Navien, ACV, Vaillant, NIBE, Siemens, Lennox, Ferroli, Wolf, Daikin amongst others. Key industry participants are actively focusing toward product innovation as part of their strategy to maintain competitive edge in the industry. Boiler is an enclosed vessel, which is designed to act as a medium to heat or vaporize a liquid by providing it heat through heat exchanger by the means of combustion of coal, oil, or gas. It is primarily used to provide space heating across residential sector. Efforts toward reducing carbon footprint driven by stringent government regulations and standards will drive the industry growth.